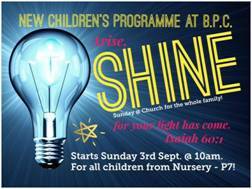 Shine is on every Sunday at 10.00am and continues during the church service. We really hope that children will enjoy this children’s programme, and that parents will encourage them to come along. Coffee will be available from 10.00am onwards in the Crosslink, and then we give you a warm invitation to join us in Church at 11.00am while the children continue to enjoy Shine.